You expected the doctor to help you, not make you worse. Now you're in more pain than before, yet you're still getting the bill. Something is very wrong with this picture! At the very least, the health care provider responsible for a mistake should waive any medical bills related to the incident. You may have to fight for even this little bit of compensation if the doctor or staff member responsible denies any actual wrongdoing. When a medical mistake in Missouri causes you to miss work, you have every right to sue for the money you would have made during that time. If you were under the care of a health professional, chances are you did not feel quite up to par when you entered the building. However, when their mistakes cause you additional pain and suffering, you deserve compensation for that undue pain. If you expect to be dealing with side effects of the mistake for months or years to come, the person responsible should continue paying for any future medical expenses you may have. 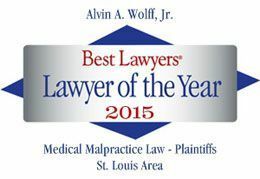 If you or a family member has been the victim of Missouri medical malpractice, call an experienced Missouri malpractice lawyer who can help you recoup the above damages. Call 314-241-2500 today for a free consultation or your copy of our informational book, The Guide On How To Pick a Lawyer.